Alley life in Shanghai is amazing and rich. You see a little bit of everything - grandmas bouncing happy babies, mothers- and daughters-in-law occasionally screaming at each other, cooking advice being dispensed from one cook to another, laundry drying in the breeze. In old houses, kitchens are at the bottom of the house facing the alley and are usually shared between three or four families. Most have indoor sinks for food preparation, but the rest of the washing (dishes, clothes, occasionally a human) is done in an outdoor sink. China solves the cleaning-outside-in-cold-weather problem with fleece-lined dish gloves (which are awesome), but it's still not a fun chore at all (moment of gratitude for indoor plumbing and the luxury of hot water). During the winter, the alleys are quieter as people stay inside where it's warm and only come down to do dishes or laundry when they have to. 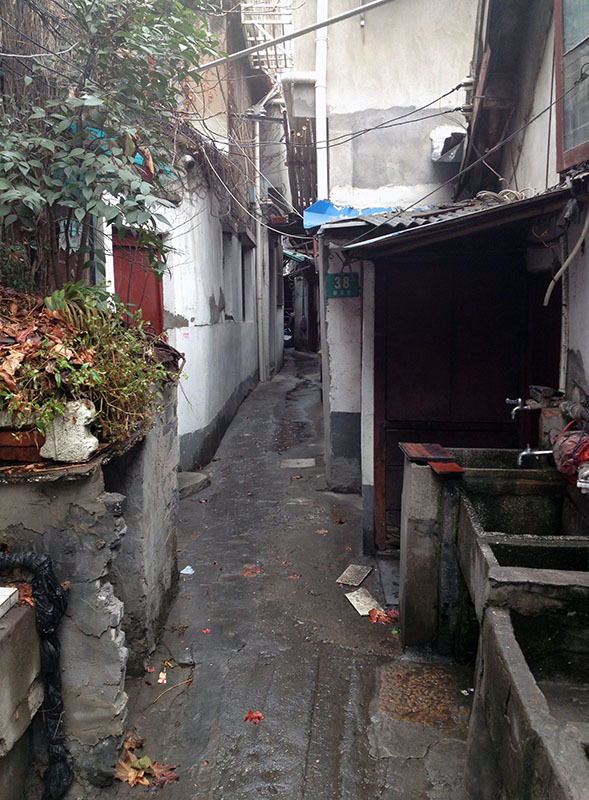 This particular alley (near the Dongmen Lu Fabric Market) is almost always full of people. Seeing it in the moody light of a rainy day, less than a mile as the crow flies from the glitz and glitter of Pudong sky scrapers was an unexpected treat.